I am very lucky in that despite living in Oz I have a friend from one of my message board haunts who for the past few SDCCs has taken my wishlist of exclusives and helped me out with the ones I've wanted. When putting my list together and counting the pennies (welll 5 cent pieces, that's the smallest coinage we have here...) I decided against getting the Mattel Giganta exclusive because my interest in sticking with the JLU line was waning. Once I saw the amazing JLU reveals at SDCC however, I regretted that call as it was clear there was alot of life in the line yet! My problem seemed solved when Mattycollector.com came online, and it seemed like a good way of trying out the new store as well so I decided to give it a go. I didn't have any problem with my order, and the international shipping was extremely reasonable - thank you Mattel!! For those still waiting for their Mattel purchase or those wondering, I've included a pic of the packaging Giganta came in just so you have an idea of the quality. I thought this was well shipped, fresh new box with plastic air cushions and a wrap around the item giving a fair bit of protection. It all seemed fairly crush-resistant, so the packaging gets the thumbs-up from me. As for the contents, if someone hadn't pointed out to me after a previous post that Giganta wasn't a 10" figure, I would have gotten a shock at her size. 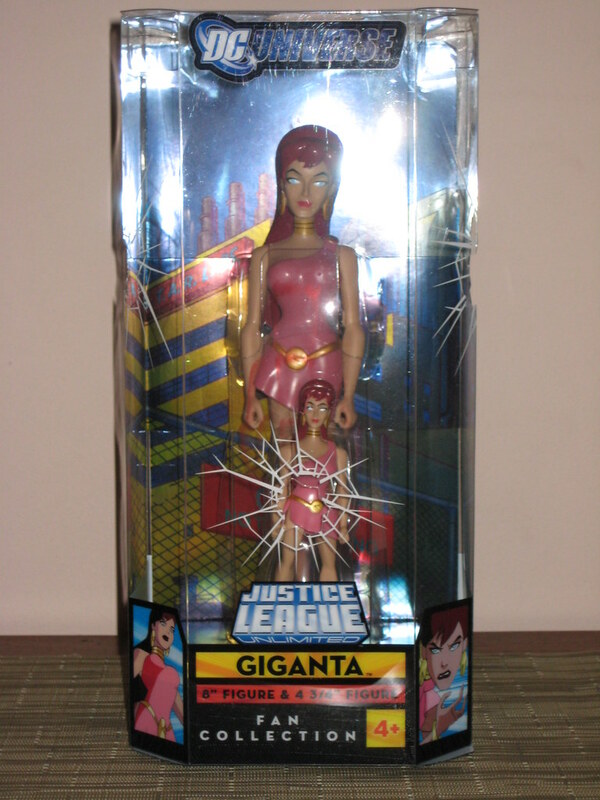 I guess I had just assumed that the large Giganta would be a 10" figure in line with the 10" JLU line, even though her actual height has probably been mentioned in lots of places. I was a bit disappointed to hear this, but on seeing the actual height of the figure, it makes sense - the 10" line is its own line and would have been TOO big to put against the smaller figures as a giant character. I'm keeping this in the box at the moment as I don't have JLU display space until my new display units come online (read: I can afford them, but Mrs AFB has said the house has to get painted first) later this year or early next. The display box is good looking and has been designed so that you can slip the figures out of the bottom to inspect them and then put it back together for display. As I'm keeping this all together at the moment I can't comment on articulation etc but it all looks to be standard JLU. .Her head does have a basic turn despite the length of her hair. I can't say the JLU version of the character is my favourite - I don't get how she stays all nicely made up when turns giant, but it is a passable version of the cartoon character. My two main criticisms would be that in the larger version, her head seems a bit too big for her body, hardly the scary baddy type, and I would have preferred the figure to have a "meaner" look on her face - she looks too nice! Overall, my first online purchase from Mattel gets a big thumbs-up - even if the first product didn't turn out to be as big as I thought it was!